Daniel Burnham, the architect and urban designer responsible for the 1893 World's Fair as well as for helping preserve Chicago's lakefront as an open park free of commercial development, famously said, "Make no little plans; they have no magic to stir men's blood and probably themselves will not be realized. Make big plans; aim high in hope and work, remembering that a noble, logical diagram once recorded will never die, but long after we are gone be a living thing, asserting itself with ever-growing insistency." We were recently asked to submit a design concept for the Chicago Architecture Foundation's show "Between States," running now at 224 South Michigan Avenue, Chicago, in conjunction with the Chicago Architecture Biennial. 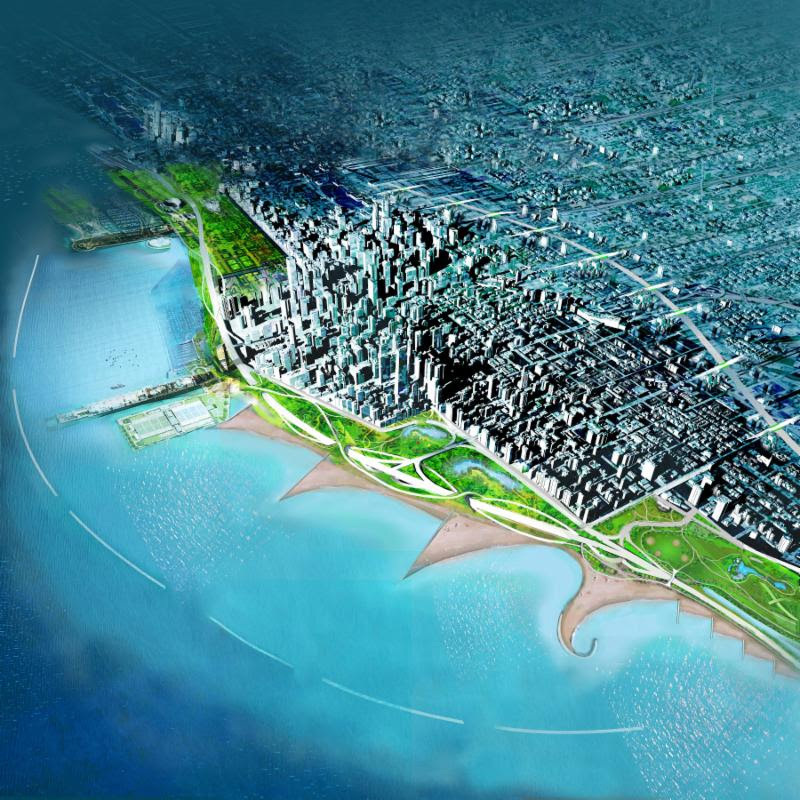 Our proposal envisions a new Lake Shore Drive in the form of an enormous graceful arc that embraces the lakefront, built on new landfill east of the city. This provides a senic ride and additional public parkland. Starting at North Avenue, the roadway extends out into the lake, east of Lake Point Tower, then continues beyond Burnham Harbor to link with the existing Drive north of the Field Museum. New ribbons of bike lanes follow this arc to provide routes that bypass current bottlenecks. The lake side of the arc is lined with new beaches, piers and greenspace. Infill within the arc creates new parks, wildlife sanctuaries, and wetlands. The existing lakeside roadway is freed up to provide easy access into the city, and link the city more closely to its lakefront.